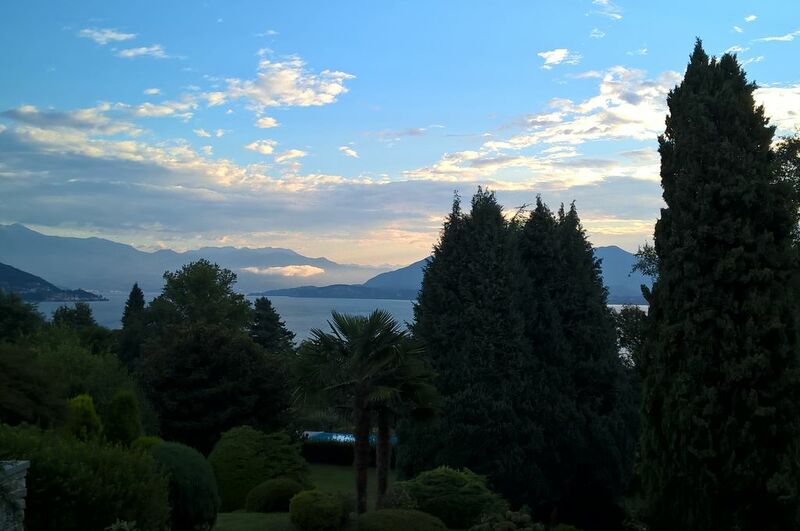 In Ranco, on the Lombard shore of Lake Maggiore, we rent a villa in an elegant, reserved and quiet environment with a superb view of the lake and the Alps. The villa is surrounded by a huge terraced garden of 3000 square meters in which there is a large swimming pool. Furnished with care and sophistication, it is ideal for holidays and up to 10 people. Nearby you can take advantage of a golf course and a beautiful bike trails, nautical activities, hiking and trekking or historical cultural visits, the countless artistic and historical Lombardy and Piedmont close. Ranco is located 45 km from Milan. At the Ground floor, organized as a large loft with direct access to the garden, you will find the living room, a comfortable fireplace and TV area and a new modern kitchen. Close to it a sort of “studio” can be used as bedroom for two persons with its own bathroom. At the first floor there are three bed rooms with two wide bathrooms for 6 or 8 persons. At the lower level near to the children/play room, with ping pong and soccer table, there is another bedroom for two persons with exclusive bathroom. Your peace and privacy will be assured. The swimming pool (10x5 mt) overlooks the lake and it’s immersed in nature and flower garden. Fantastic house with a beautiful view, garden and pool in a very good location. The house was very well equipped and we enjoyed our stay very much. The pool and garden were very good and we could enjoy them all by ourselves. The view from the house was beautiful. House was convieniently located close to the village, the lake and for example supermarket. It was very easy to make day trips to places like Stresa, Orta Lake and even Switzerland. Sebastiano, the owner would also give us good tips for discovering the surroundings. Also the housekeeper was very helpful, if we had something to ask for. We could highly recommend this house and would also like to come there again. I'm somewhat reluctant about telling people about this place - it will make it more difficult for us to return! Anyway, the pictures of the house and extensive gardens do not do justice to the property, view or the idyllic location. The owner, Sebastiano, could not have been more helpful and we will be returning either to this house or others that he owns. There is someone who lives onsite but I did not see or hear him - although I presume he must have mowed the lawns and tended to the garden at some point. We visited a number of places around the Italian lakes during our stay - and if you are looking for peaceful surroundings and a relaxed time away from home then Ranco is the place to be. Thank you James, you left one of the nicest feedback I never received. I'm happy you enjoyed your stay. You have a wonderful family and I spent a lovely evening with your sons at the San Siro Stadium. You left the house perfectly and I look forward to welcoming you again in one of my houses. We will keep in touch. Fantastic villa, beautiful location. Loved it! My family and I stayed in this beautiful villa for two weeks, from 8th – 22nd July 2017. The villa has everything we could have hoped for, lots of space for our four teenagers to spread out in and really lovely open plan family seating areas (for lounging and dining) for us all to be together at meal times. The gardens and pool are gorgeous and we spent most of our two weeks here with only the odd day out and about sightseeing. We ate in for breakfast, lunch and dinner almost every day, with a family of 7 to feed this was by far the easiest and cheapest option. The BBQ was pretty much always on! There are table tennis and table football tables down in the basement which we made good use of, with the basement also being the coolest area in the house. The facilities in this villa really are great, there is loads of space, the five bedrooms, with three en-suite bathrooms, were perfect for the size of family and meant there was no queueing for showers required. Seb (the owner) is very friendly and gave us lots of suggestions of places to visit and to eat. Ranco itself is lovely, the small bar on the water (Bar Il Molo de Ranco) is a really nice place to visit any time of the day or night, with live music on at weekends and occasionally on week nights. The staff were very friendly and the drinks very reasonably priced. Just watch out for the mosquito’s on still evenings. There is one small shop (delicatessen) a pharmacy and a couple of restaurants. These are all within walking distance of the villa. There are a few different local supermarkets – within a five minute drive of the villa. We swam in Lake Maggiore on a few occasions, our favourite spot being a little manmade sandy beach in Ispra (five minute drive from the villa). It was a quiet little haven with a small café and the beach allowed easy access into the lake. We spent a day in Venice (a three hour drive) and a day in Rome (an hours’ drive) – both definitely worth a visit however take your walking shoes and lots of patience. They're very, very busy. We absolutely loved Lake Maggiore and what really made our holiday was the villa – absolutely perfect for our needs with amazing views of the lake and the mountains. The property in Ranco is a perfect place for a family holiday. The house is well equipped with a huge garden and wonderful swimming pool. My 6 year old son really got the hang of swimming during the week in it. The views over Lake Maggiore are great, and it benefits from being on the south side of the lake so the restaurants during our visit in June were not packed with tourists, just locals. Great restaurants in the area, particularly in Angera which is a 10 minute drive, though staying in with a glass of Piedmont red and some meat on the barbecue was exceptional. Sebastiano, the owner, was very helpful and a great host. One very minor request would be to have some fans/AC for the bedrooms as even in late May/June it was pretty hot/humid at night. Overall, highly recommended, particularly for families with kids as the pool is a real bonus. The views from the villa over Lake Maggiore were wonderful. The gardens were well kept and were complemented by the garden furniture which we used for breakfast every morning, most often to the call of a cuckoo. The villa was clean, well-appointed and all the rooms were spacious, with shutters to reduce the heat during the day. It was situated well away from any noise of traffic but only a ten minute walk from Ranco and a short drive from a well-stocked supermarket. The swimming pool was secluded and free of leaves or other garden debris. It was furnished with a parasol and sun loungers on a clean tiled surround. All in all, the villa was ideal for a relaxing family holiday and proved to be a good base from which to visit places of interest on and around the lake. Thank you Vincent P. It has been a pleasure to host your family in my Ranco house. I look forward to meeting you again. Our host, Sebastiano, was warm and gracious, and could not have been more accommodating. He helped us out with some personal issues before we even arrived, and was there to greet us with additional helpful tips in planning our stay in Italy. The villa was even better than advertised! It was clean, comfortable, stylish, and fully equipped. The view looking out over Lake Maggiore was tranquil and beautiful. It was incredibly quiet and relaxing - just the retreat we were hoping to find.The location is great for touring around the Lake region. We hated to leave when the week was up and we have already recommended the house to all of our friends! We hope to stay in touch with Sebastiano - he was simply amazing. (Text automatically translated) Good and reputed restaurants nearby. Lake Maggiore at hand (Stresa, Arona, Angera, Laveno). Hermitage of Santa Caterina. Bike tours and walking recommended. Beaches on the lake and ferry trips. Museum of Transport in Ranco. Mountain nearby. Golf Monate, tennis courts and swimming pool are all within 10/15 minutes by car.